While its parent club staggers toward the end of a deflating, disappointing season, the Memphis Redbirds are headed back to the playoffs. Having won 11 of their last 14 games to (barely) catch the Iowa Cubs, the Redbirds will host Oklahoma City Wednesday in the first game of a best-of-five series to decide the Pacific Coast League’s American Conference champion. Memphis won a thriller in 15 innings Sunday in Des Moines, then came from three runs down to beat the Cubs behind a 9th-inning home run by Mark Hamilton on Labor Day to tie Iowa for a PCL-best 82 wins. Memphis advances by virtue of a better record in divisional play. “Rather than rely on organizational talent, [Cardinal general manager John] Mozeliak imported released players Randy Winn and Aaron Miles and exiled third baseman Pedro Feliz. [Pitching coach Dave] Duncan offered a brutally honest assessment in June when he insisted the system could not support a championship club . . . . If your name is Allen Craig or Tyler Greene or Evan MacLane or P.J. Walters or Daniel Descalso, the sentiments of Mozeliak, Duncan, and (one must presume) Cardinal manager Tony LaRussa must be fuel for competitive fire. These five players will be seeking a second straight PCL ring, while the Cardinals — behind the likes of Winn, Miles, and Feliz — now rely on help from other teams to merely contend for a wild-card playoff ticket. There’s an overlooked skill in baseball, one that tends to get discounted as various “tools” are measured in a hitter’s value, or as arm strength and an out-pitch become the only qualifications for a big-league promotion. The overlooked skill is winning. Knowing how to win. Knowing when to win. Knowing a game isn’t over until your club has made 27 outs (sometimes more, as the Redbirds proved last Sunday). If you watched the Cardinals score two runs in three games against the lowly Astros last week, you saw a team that has forgotten an ingredient to winning. If you listened to the Redbirds come back late in that do-or-die game at Iowa Monday, you recognized a team that knows only winning. 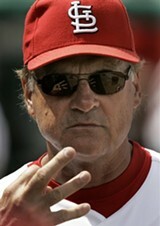 The LaRussa Way has long been to go with veterans on the bench. While Jon Jay managed to land the rightfield job in St. Louis this season (only after Ryan Ludwick was traded to San Diego), the Cardinals have left the likes of Craig, Greene, and Descalso in Memphis. Unable to find an “impact player” in Memphis, the Cardinals are leaning on Winn, Miles, and Felipe Lopez to support Albert Pujols and Matt Holliday. Consider these numbers: Through Sunday, Winn, Miles, and Lopez had combined to play in 3,596 big-league games. They have combined to play in a total of seven playoff games (all of those by Miles, with the Cardinals, in 2006). Whatever skills that trio might offer, winning doesn’t jump out. The Cardinals’ worries are for next month, next winter. This week, this month, the Memphis Redbirds and its band of overlooked winners will aim to further endear themselves in the hearts and minds of Mid-South baseball fans. And if those fans are the only ones to notice the skills that separate them? Just check the National League standings.